Intermediate Guitar Level 2 continues the teaching progression established in Intermediate Guitar Level 1. 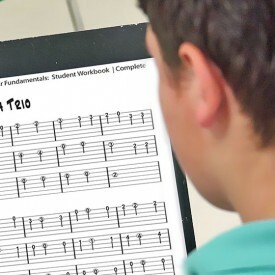 This course also provides an excellent entry point into a blended learning class model for students who have developed basic note reading skills and instrumental technique using another method. The course contains 20 lessons designed to be taught over two semesters. Like all Consonus courses there’s a focus on ensemble playing with guitar ensemble arrangements that are perfect for concert performance. Ensembles include audio backing tracks. There are numerous solo pieces and lead sheets as well. All repertoire integrates with the curriculum and emphasizes the diverse capabilities of the guitar as an accompaniment, solo, and ensemble instrument. Styles include folk, country, blues, rock, latin, swing, and classical. Blended learning enables teachers to use the same audiovisual material to aid classroom instruction, that students access outside of class to review, model, and accompany home practice. Consonus courseware is the first classroom guitar method that supports teachers with the additional lesson content they need including supplemental video on types of guitar, how to practice, instrument maintenance. In addition the Online Learning Site provides learning management tools such as online practice logs, student lesson progress, calendaring and messaging. 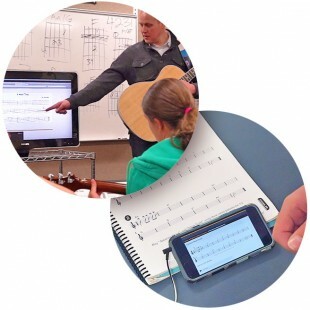 Finally in addition to a pedagogically correct curriculum with it’s many self-teaching and distance learning features, numerous teacher training resources are available to assist teachers in the best practices of classroom guitar instruction. Click on the tabs below to learn more about what the CMI blended learning course for intermediate guitar has to offer. To fully experience and appreciate everything that is included you should really click here to start your 60-day free trial. 11-month subscription to the Consonus Online Learning Site with related online course content. Every exercise, solo, and ensemble piece is presented in its own review and/or practice video, demonstrated by the author and utilizing rhythmic audio backing to develop student timing and ensemble playing skills. Online content mirrors the Course Lesson Plans and Student Workbook. Non-lesson related videos cover topics such as stringing and care for the guitar. Ensemble rehearsal techniques and more. The curriculum moves forward with the addition of new chord vocabulary in the open position, as well as movable power chords and barre chords. More complex strum patterns syncopated rhythms. Fret board knowledge expands to include upper position reading on treble strings. The emphasis on improvisation continues with an exploration of new pentatonic scales and sequences. Finger style skills are developed as students are introduced to finger picking patterns that they can apply to chord shapes on combinations of strings. Repertoire includes numerous original solo and ensemble pieces in styles that include contemporary, classical, and jazz that are ideal for both practice and performance. The Intermediate Guitar Course has 9 ensembles in a variety of styles. Every ensemble has a playalong track for the entire ensemble or with one of every part removed so students can practice along at home or in the classroom. Sign up for the 10-day free trial to hear and see all of the ensemble pieces. 02. My Best Friend Register for a Free Trial to hear this track. Online teacher’s license & connected student licenses bundled with course workbooks. Online teacher’s license with connected student licenses. Individual course workbooks for students and teachers. See everything this course has to offer. of the complete course workbook.